Fishing for Parasites was totally coded in Processing (!) for the Legendary Fishing Jam. 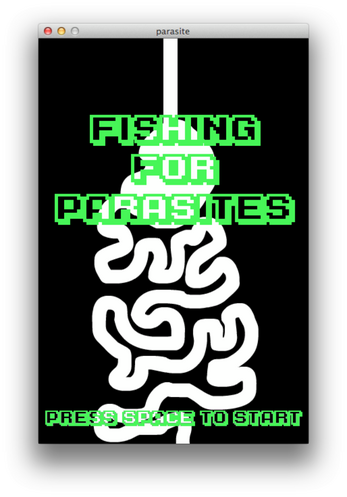 It's a game about using an endoscope to 'fish' for parasites in your patient's GI tract. Guide the endoscope using the keyboard keys. Touch the sides of their insides and DEAD. Double back on your endoscopic cable and DEAD. In true arcade game fashion, things get faster as you keep playing, and the parasites go deeper and deeper into the intestines.